You must add the serial port to your openhab start script. This is a limitation of the used serial library. Here a documentation that should help. It is possible to “update” eBus standard to correct device type? openhab or the binding is not refreshing items? Have you created a new ebus bridge with paper ui? 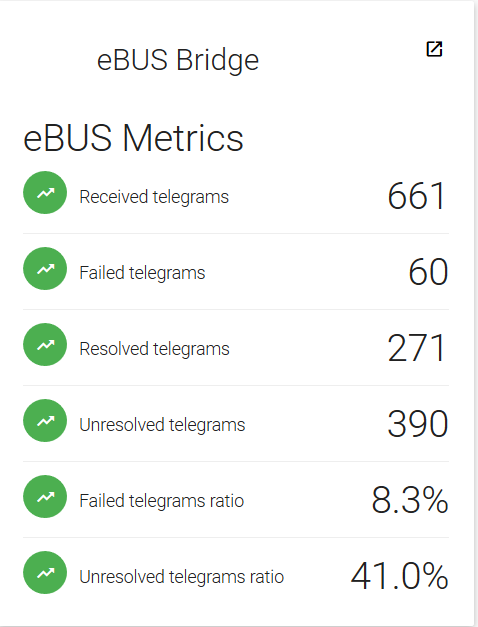 Has the discovery function found some ebus things? In general your setup looks good. Your problem is, that all your devices are not supported by the binding at the moment, except BIA. You can check the supported devices if your add a new thing manually. Thank you a lot for the time you already have spent on my topics. Regarding your hints I will first start to add a thing in .thing file and after that try to add manually mm and the bm2. Regarding parameters I have no idea (I.e. bridge, standard etc), the first part of the thing could be correct but also not sure. It would be great if you could advice me on that. Short feedback, I’m working on a modified readme file with detailed information to text configuration files. So a new enhanced version of the documentation is available. Still room for improvements but better than nothing. Is there a mistake regarding allocated things to the SAs? Is there a mistake in my configuration and can it be improved? How can i interpret the data in a more efficient way (at the moment i try to allocate data be comparing numbers of log:tail with what is shown on my physical Wolf devices. A question detached from the ones above is regarding the definition of types within things as outlined in your recently updated readme: What is the purpose of defining the types? Is it only to define the names of the channels used afterwards in attaching the items? you have the same problem as me, there is no documentation about the Wolf/Kromschröder commands. Vaillant has here much better support. As far as I know I’ve researched the largest command list for Wolf at the moment. You could enable the advanced logging to generate the unknown commands file. You can send me this file, I will have a look on it. But I would be great if you could send me some reference values/temperatues from the time of logging. This is hot water, so I thing it is correct. If this value is from a eBUS Standard than this is defined by eBUS group. Same here, eBUS Standard only use integer for some temperature values. No, your setup looks correct, you can only create custom configurations to support more commands. You can use the resolved and unresolved log files to analyze it with Excel etc. And I have an Wolf ISM7i installed, but only used once. Now it simply connected. But it was useful the see the current values while watching the commands. Thank you very much. Do mean by the unknown command file the ebus - unresolved.csv file? I’m trying to use the new ebus binding, but I can use some help getting it configured. Is have a “standard” ethernet bridge from Esera and a Vaillant Ecotec plus heater. which protocol do you use? UDP or TCP ? The binding only works with TCP.